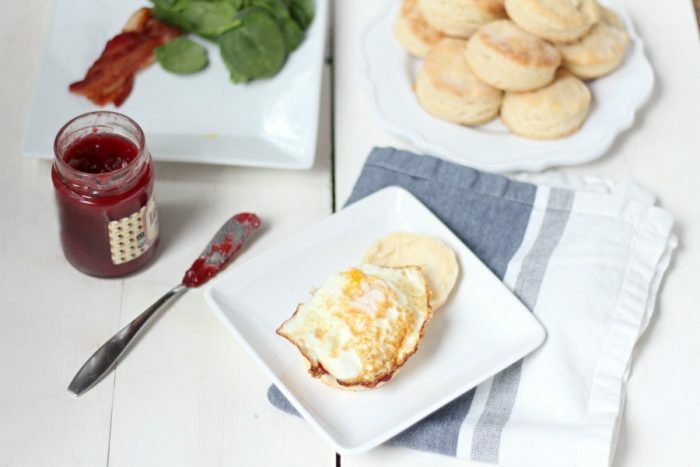 Bacon, egg, and marionberry brunch biscuits are the perfect weekend breakfast. 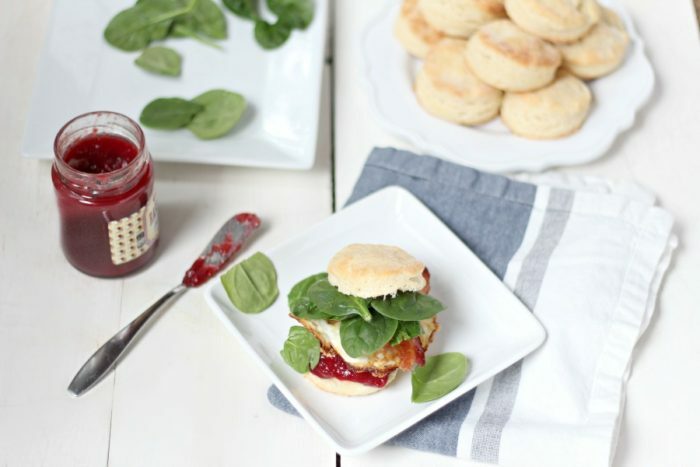 Sweet, salty, rich, and a hint of bitter from the arugula (or spinach), these brunch biscuits will hit all the senses. Seriously, you have to try them out. This post contains affiliate links. Affiliate links helps support A Blossoming Life at no extra cost to you. This idea is totally not original. A month or so ago (I don’t even know these days, as time flies soooo fast), we took a break from our kitchen makeover and made a “quick” trip down to the redwoods in California with my in-laws. I say “quick”, because it felt like an eternity. Ari was 4 months at the time, and he decided about an hour into the trip that he was very over car rides. During the 5 hour road trip – each way, mind you – he was either sleeping or screaming, and I just kept looking at my husband with the look. You know, that look that says “you planned this little trip that I didn’t really want to do so this is your fault.” Not my finest moment as a wife. 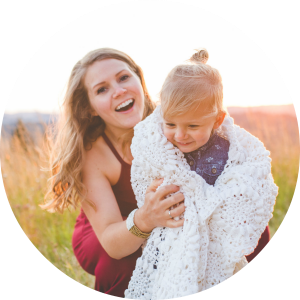 But here we are in a moving car whose walls seemed to just keep closing in as my sweet little man acts like someone is torturing him. Stress was high; especially for me! That’s just me making excuses for my bad behavior. I can’t be perfect all the time. Back to my not so original idea. On the way home, we stopped at this adorable hole-in-the-wall, farm-to-table restaurant. It was the perfect timing. My head was about to explode, and we still had 2 hours left until we made it back home. It was one of those super adorable restaurants in an old brick building in a cute little downtown where they knew just about everyone walking through the doors. And they had unlimited coffee. They won my heart after that. Me + coffee = a very happy girl. I ordered this delicious buttermilk biscuit topped with poached eggs, bacon, arugula, and lots of marionberry jam (like this one) . There might have also been avocado on it, but I can’t remember. It was obviously an emotionally scarring time for me. But the combination of the sweet jam, salty bacon, and rich, runny egg yolk was amazing. Yumm. I need to make these again like ASAP. BUT what the heck is marionberry jam? It’s an Oregon thing. I never heard of it until we moved here last year. The marionberry was invented here and is a cross between a blackberry and raspberry. They are basically really sweet blackberries and are AMAZING. Turn that into jam and even more amazing. I could drink the stuff. August and I tried one for the first time last summer at a small antique store at a farm. It was owned by a cute elderly couple, and they took us to their amazing backyard to pick marionberries. By the time we got home, August’s face was covered in red berry juice. I’m not even sure how many she got into her mouth. Whoa buddy, this was a really random post full of really random stories. But we did eventually make it back home without completely losing our minds. And the time we got to spend on the coast and among the redwoods was really fun. Running around looking at rocks, driftwood and sea creatures, plus flying kites on the coast, was fantastic. It was almost worth it hahahah. 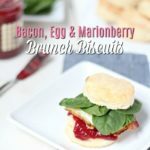 I recreated their amazing marionberry brunch biscuits and simplified it for me. I baked the entire package of bacon so we could use it for this and other meals throughout the week. I made fried eggs instead of poached and made enough biscuits to eat the rest of the week for breakfasts. So, while it was a little complicated to make it that lazy Saturday morning, it also served as some meal prep and made my life easier. 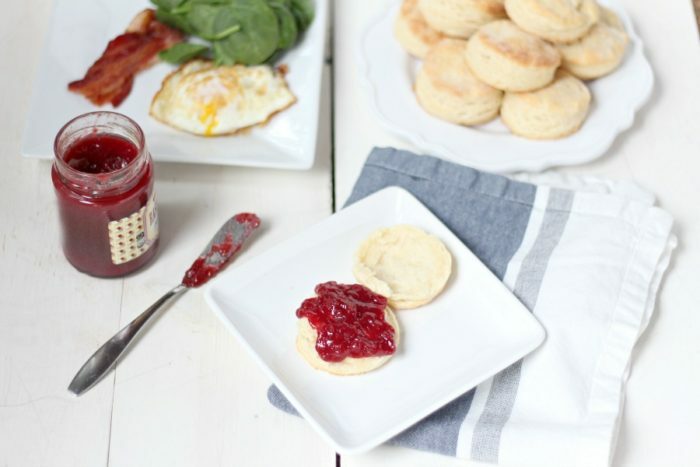 Heck, you could use pre-made biscuits and just break and bake them. That would make it super easy. 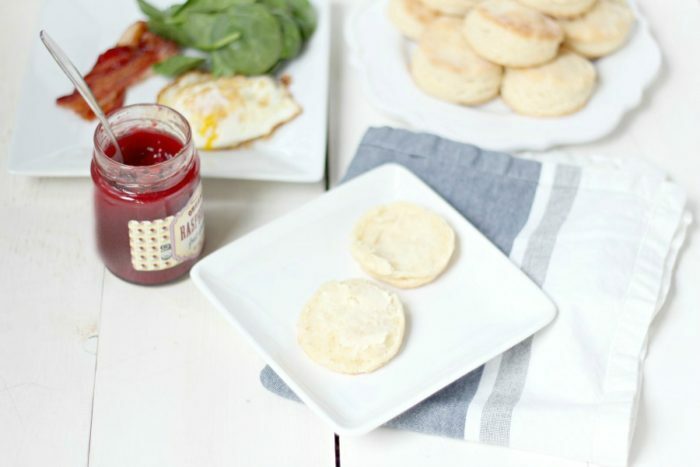 Bacon, egg, and marionberry brunch biscuits are the perfect weekend breakfast. 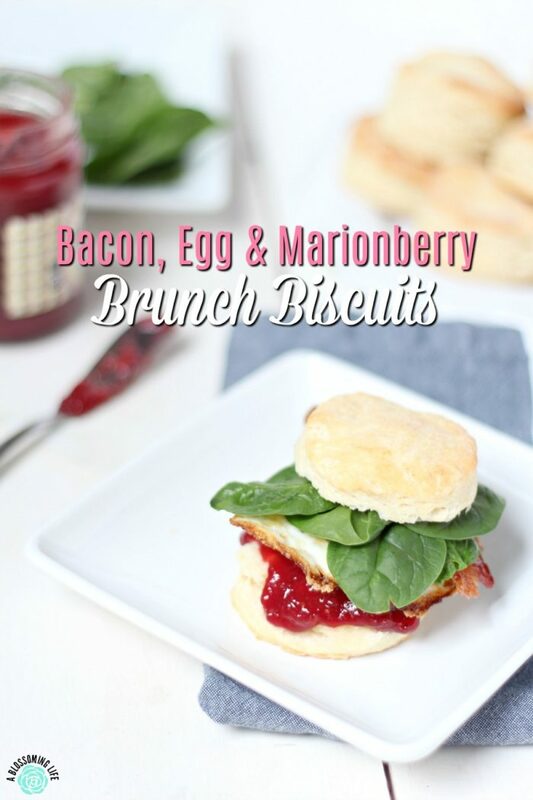 Sweet, salty, rich, with a hint of bitter from the arugula (or spinach) these brunch biscuits will hit all the senses. Seriously, you have to try them out. 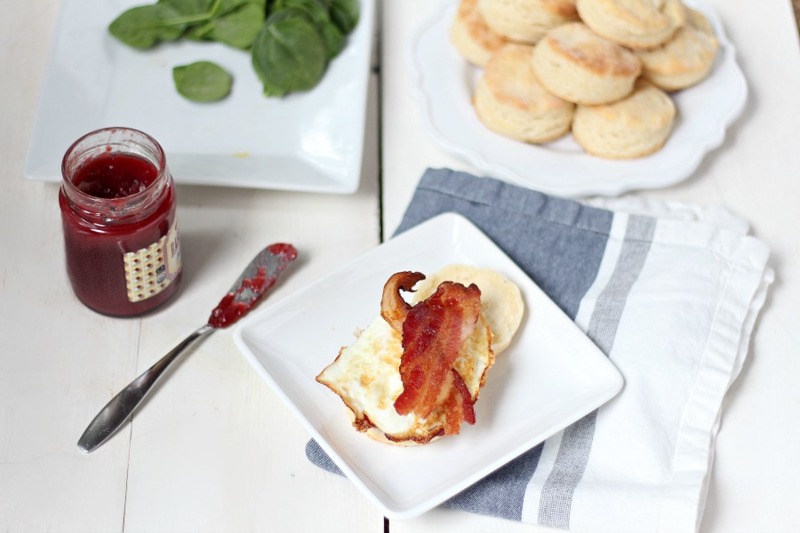 Make separate ingredients - bake biscuits, fry or bake the bacon, make eggs (fry, poach, or make sunnyside up). Open fresh biscuit. Smother with jam. Add egg, slices of bacon, greens AND other optional ingredients. Top with biscuit and smother some more jam if you fancy... I'm not here to judge. At the restaurant they topped these biscuits with powdered sugar. Do you brunch? We don’t usually, so we had “pre breakfast” on this day. Little people are always so demanding to eat at their normal time everyday.